Colour printed lithograph on wove paper with some restoration, with English manuscript notation. Glazed. Natural wood frame. Size: 36 3/4 x 24 3/4"(93.4 x 62.9 cm.) 38 5/8 x 26 5/8"
German WWI 1914-15 propaganda map poster, part of a campaign to raise war loans to support the U-Boat blockade against England. This is the finest example of a German WWI propaganda poster we have yet seen, with a great 'liberation' association English manuscript inscription. A graphic poster being very slightly toned, otherwise in generally good overall condition, considering it is World War I ephemera over 100 years old. There are some areas of loss along the R.H. border only marginally encroaching upon the image, mall hole in area of S. Downs and in cliffs off tip of Cornwall, S. Wales & channel, all of which have been sympathetically repaired. There is also some general creasing due to folding, but generally this authentic and now very scarce period poster is in remarkably good shape and displays well. The poster was the work of the influential German artist and publisher Friedrich Wilhelm Kleukens (1878 -1956) whose initials appear in the lower right-hand corner. A German propaganda poster issued in late 1914 or early 1915 by the Mainzer Anzeiger Company (there was also a reduced version postcard) which was published to raise much needed war loans through contributions from the German populace. 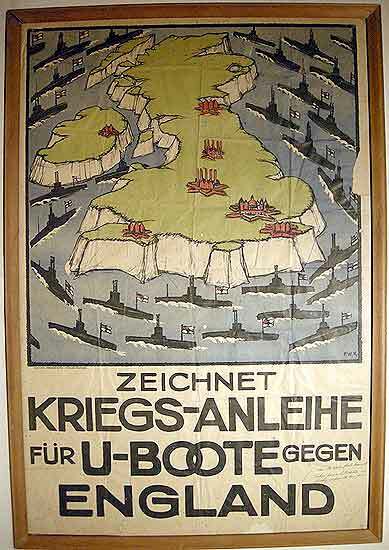 It is in the form of a stylized map of the British Isles encircled by a menacing ring of German U-boats, the message makes clear that these contributions will assist Germany’s submarine warfare against Britain. Following the outbreak of war in August 1914, Britain had declared a North Sea blockade of Germany, a vital element in the strategy of trying to strangle the inflow of imported goods and so weaken the economy & starve Germany into submission. 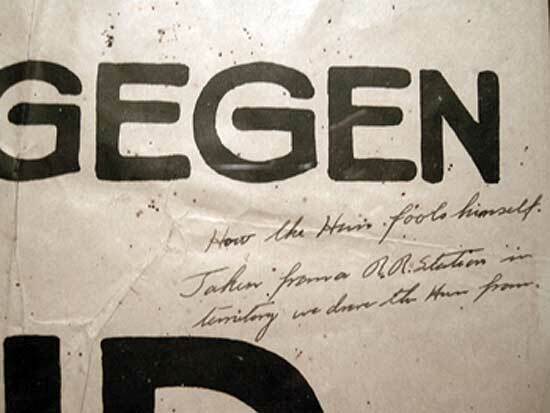 The propaganda fallout of the sinking of the Lusitania caused German politicians to reign in U-boat operations and in September 1915 they were entirely suspended. Unrestricted German submarine warfare would not resume again until February 1917 (with a considerable and immediate impact upon the Allies) but it caused America to immediately sever diplomatic relations with Germany, and, only a few months later to finally enter the conflict herself on the side of the allies.